“Modern universities are one of the most powerful mechanisms we have for changing and improving peoples’ lives,” said Professor Ian Jacobs, Vice-Chancellor and President, UNSW. 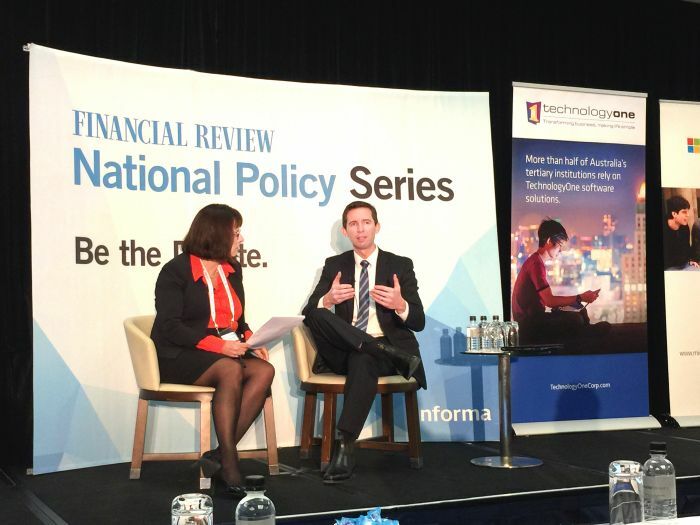 Michael Stutchbury, Editor in Chief, Australian Financial Review added: “We are at a critical juncture where the government faces a choice of pushing all these reforms that will carry higher education forward, or letting it stagnate. Federal Education Minister, Simon Birmingham added: “Our government aims to build on our already strong higher education sector, to develop one of the best higher education systems in the world. Professor Jacobs reflected on the country’s public higher education investment compared with other advanced nations. Still new in his role as Education Minister and working to overcome tensions from outgoing Minister, Christopher Pyne, Senator Birmingham said, “Higher education is expensive and it needs to be paid for somehow. From the public purse, from the direct beneficiaries of that education, or from a combination of both. I will be consulting with the higher education sector, students, employers, senate colleagues and other colleagues on how we can best find a sustainable basis for taxpayers to best fund a higher education system with fair, equitable access to students”. TechnologyOne R&D Evangalist, Matt Deshon, shared insights on the expectations of millennials, as higher educators’ primary customers. Matt emphaised the importance of providing cloud based services to connect students, staff and stakeholders on mobile devices. Professor Eric Grimson, Chancellor for Academic Advancement, at MIT spoke about the enormously successful edX MOOC program that they developed in conjunction with Harvard University. He went on to explain how MIT research has proven the effectiveness of online learning over traditional lecture-based formats. He challenged the audience to disrupt their own institution and consider fundamental changes in their university model. Minerva focuses on cognitive learning, problem-solving and exploration, as students experience a diversity of cultures by living in up to seven world cities, as a part of their undergraduate degree. Overall the Summit painted a positive picture of Australia’s place in the world in higher education. The sector’s role in innovation through research was also much discussed, after the new Prime Minister Malcolm Turnbull’s appointment just six weeks earlier. The tone and rhetoric of the Summit was one of optimism for the sector in step with the prime minister’s ode to optimism. Higher education in Australia will continue to play a role in shaping our nation’s future through economic drivers, productivity and original thinking to build a smart economy. The size and scale of its role is yet to be seen but its importance was acknowledged through the Australian Financial Review Higher Education 2015 Summit, and continues to be through ongoing public debate.